Leading power tool manufacturers have conspired for years to thwart adoption of a safety device that could prevent thousands of finger amputations and other disfiguring injuries in table saw accidents, according to a federal antitrust lawsuit filed by the developer of the safety technology. The complaint by SawStop LLC, of Tualatin, Ore., names top power tool companies, including Bosch, Black & Decker, Makita, and Ryobi Technologies. It contends they orchestrated a secret boycott of SawStop’s finger-saving technology, fearing that if it gained traction, they would face increased liability for injuries from standard table saws. As reported by FairWarning, more than 67,000 U.S. workers and do-it-your-selfers suffer blade contact injuries annually, according to Consumer Product Safety Commission estimates. That includes more than 33,000 injuries treated in emergency rooms, among them 4,000 amputations. The SawStop system instantly stops a whirring blade on contact with skin, typically resulting in a minor nick instead of a life-changing injury. The suit, filed in federal district court in Alexandria, Va., says the big manufacturers joined forces to spurn the technology when it was offered to them, and manipulated industry guidelines to keep safety systems, such as the one developed by SawStop, from becoming the industry standard. As a result, the suit contends, SawStop should be paid at least $10 million in lost revenue along with treble damages. The 40-page complaint was filed on Feb. 20, and the 22 defendants—including saw manufacturers, their subsidiaries and affiliates—have yet to file answers. But Kilborn said Bosch “has acted in a lawful and responsible manner, we deny the claims in the lawsuit, and we will vigorously defend our position in court.” A Makita spokesman declined comment, and Black & Decker and Ryobi did not return calls. Though not named as defendants, the Power Tool Institute, an industry trade group, and Underwriters Laboratories, a safety consulting firm that oversees the content of voluntary table saw standards, were described in the lawsuit as co-conspirators. Representatives of both groups declined comment. Industry officials have said in the past that their saws are reasonably safe. They have claimed that the cost of flesh detection technology and paying royalties to SawStop would make some popular lines of saws unaffordable. The suit says the conspiracy began in 2001 or 2002, but was not revealed until February, 2010, through testimony of a retired Ryobi official at a trial in Boston. The case involved a worker named Carlos Osorio, who had sued Ryobi after suffering severe hand injuries in a table saw accident, and won a $1.5 million judgment. During the trial, David Peot, Ryobi’s former director of advanced technologies, testified that at meetings of the Power Tool Institute, officials had voiced concerns that the SawStop technology could expose them to greater legal liability. 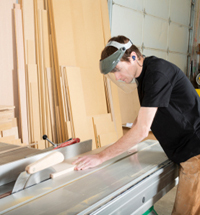 The fear was that “if another manufacturer were to develop a concept of improved table saw safety, then the manufacturers who don’t have that would certainly be at a disadvantage when it comes to product liability,” Peot said. Because of potential statute of limitations issues, the Peot testimony could be pivotal in determining if the SawStop case survives defense dismissal motions. Under federal law, anti-trust claims must be brought within four years of alleged violations, but the time “can be extended if the defendants willfully concealed that conspiracy,” said Joseph P. Bauer, a professor and antitrust expert at the University of Notre Dame Law School. According to the lawsuit, the clock should start running at the time of Peot’s testimony—almost four years to the day from the filing of the case. The SawStop invention involves running a weak electrical current through the saw blade. When a person comes in contact with the blade, the body absorbs part of the signal. A sensor detects the change in current and activates a spring that jams an aluminum wedge between the teeth of the blade, which acts as a brake. It all happens in about three milliseconds—about 100 times faster than a person could react after touching a blade. The system was invented by Stephen Gass, a lawyer with a PhD. in physics, while tinkering in the workshop behind his house in 1999. After several years of fruitless attempts to license the technology, Gass and his SawStop partners decided to go into the table saw business themselves. Since 2004, they have sold more than 50,000 of the safer saws, which are larger and more expensive than most models. The company has compiled a list of more than 2,000 “finger saves,” in which a user came into contact with a spinning blade on a SawStop saw. In more than 95 percent of the cases, the lawsuit states, the result was a cut that required no more than a band-aid. In response to SawStop, five of the larger companies—including Black & Decker, Bosch and Ryobi—formed a joint venture to develop their own injury reduction system. The joint venture ended in 2009, when members said they had developed a safety system superior to SawStop’s, though they have yet to include it in their saws. A version of this story appeared on FairWarning (www.fairwarning.org), a Los Angeles-based nonprofit news organization focused on public health, safety and environmental issues.